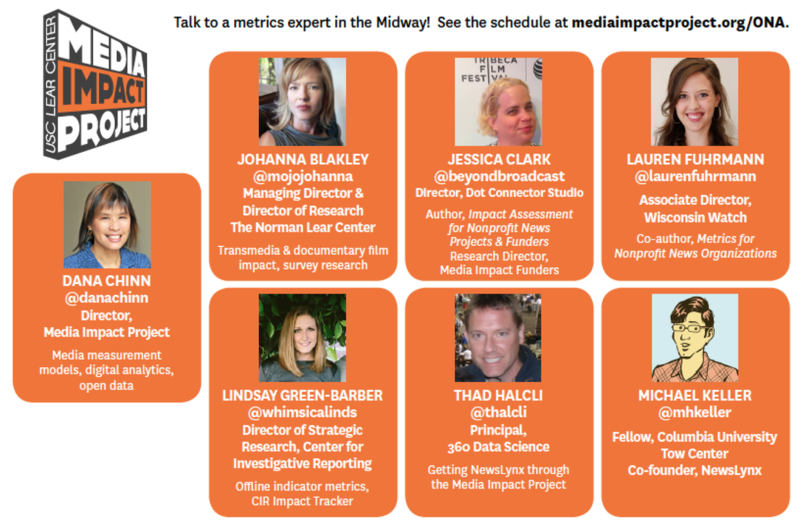 The Media Impact Project will be sponsoring the Audience Engagement + Impact track at ONA. Take a look at the entire schedule here. Sometimes we can feel as if journalism is becoming more about the numbers than the people. We might feel overwhelmed by the amount of traffic data that’s available to us. In this discussion, Dana Chinn, the director of the USC Media Impact Project will talk about how meaningful measurement starts with adopting a few concepts to help you consider your news audience. Moving the Needle: What's Your Impact? Join MIP Director Dana Chinn for an open and inspiring conversation on challenging topics in your area of expertise. Check back soon for a list of topics, and you'll have the opportunity to join in the conversations that interest you the most. These discussions are aimed at tackling major issues that journalists face, and will give you an opportunity to collaborate with top minds in the field to find solutions and explore new ideas. We have several media experts available each day in the Midway for Office Hours! Just tweet the expert you are interested in speaking with to set up a time.